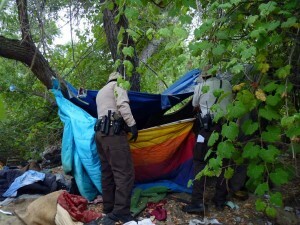 Officials say the amount of homeless youth in the county is not abnormal. There are about 1.5 million homeless youth in the United States, said Jessica Thompson, a coordinator for the County Office of Education’s Homeless and Foster Youth Services. Some of the homeless youth in SLO County couch surf, bouncing from home to home. Others live on the streets, and some end up in juvenile hall. Felipe, a former homeless high school student, said he chose to leave his parents’ Paso Robles in order to escape an abusive situation. Felipe used marijuana to cope and spent some time behind bars, but still managed to graduate high school six months early and get a job. Community members trying to assist homeless youth are planning to create more group homes and a volunteer host program. Two of our young homeless winners just set up shop in the bushes bordering my office parking lot. Had a nice little set up for themselves, sleeping bags, bicycles, assorted likely stolen property. The police are confiscating it now. Won’t they be happy when they arrive home from a hard day begging and ingesting illegal substances. One thing you will never see are homeless Mexican immigrants and their families living on the ground and in local creeks. They all have safe places to stay and jobs awaiting, processed through privately owned nonprofit facilities such as the El Camino Homeless Organization located in Atascadero. I see where you are going with your post but I believe many if not all of these teens are on the streets by choice. I think they push away any real aid and help because of substance addiction. If we really want to help these young people we would take a tough love approach to their plight. Take away all services until they decide to go clean. Otherwise we are just furthering their drug and alcohol demise. These people are young…they can still be saved but they won’t be saved by well meaning people doing stories on them. Please spread the word to this population, because I have come into contact with said population looking for work, housing, medical insurance and housing. And if ECHO is caring for all the homeless non documented, please let Catholic Charities know they have them covered, because they have been working for years, trying to fulfill their needs. This problem could be in part due to California being a “nanny state” as it relates to child labor laws. Unless your parents own controlling interest in a business, a minor can’t hardly do anything anymore besides sweep the floor or work at the local hamburger shop. My 3 grandsons know how to frame a house from start to finish, but because they are not 18, they can’t be employed in the construction trades. I understand not placing children in high-risk occupations, but this State has gone way to far in limiting what a young person can do after school and weekends to earn some money and learn to work. Is there a breakdown of illegal vs legal homeless children? and if their legal status was due to being born here by the parents of illegals? Seems like fare questions but I know some will think otherwise.